IntraCell, a comprehensive intra-workout supplement that reduces muscle breakdown during training and potentiates the body for post workout recovery and growth killing catabolism in its tracks. Based around the 2:1:1 ratio of BCAA which in scientific studies has been shown to spare muscle tissue during intense training. Everybody's talking about pre-workout and post-workout and the "anabolic windows", yet they're forgetting possibly the most crucial period of all: intra-workout! The solution? Intra Cell by Boditronics! Intra Cell immediately halts the catabolic process and is ideal for a huge variety of athletes. It doesn't matter whether you're a bodybuilder, athlete, MMA fighter, boxer, fitness enthusiast, endurance athlete, etc; Intra Cell will extend your workouts, prolong performance and increase protein synthesis. You heard that right! Intra Cell has the power to amplify anabolic reactions in your body during a stereotypically catabolic environment! What more could you want? Add 1 scoop (about 25g) to 500ml of water and shake in a blender for a few seconds. Take about half the drink 15 minutes before training and sip the rest during your workout. 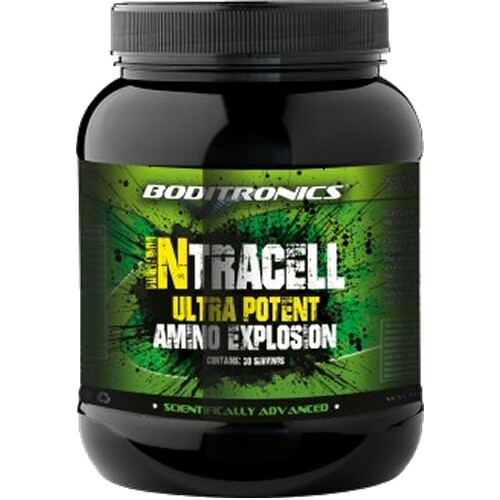 IntraCell can also be used immediately after your workout as an alternative to a regular recovery drink. Mix as above and consume immediately after training. Wait 30 minutes before eating or having a protein shake. Want to know something or just want our view? Please join in and ask your question..
Strategic Fitness Ltd is a UK registered company 09131492, VAT registration 197 0427 87.